I started this thread for reference, since there are so many questions about which cavy pellets to feed. Choosing a pellet is based on freshness/quality control and a large amount on ingredient quality. This thread should hopefully help address some of the questions about what to look for. Firstly--Vets are now addressing the basic need of alfalfa hay (a legume) versus timothy hay (a grass hay) diets. Lynx has more info in the Reference forum. Generally speaking, Alfalfa diets are suited for young cavies (under 1 year) and pregnant or lactating females. Timothy diets are for healthy adults over 1 year. The legal organization responsible for regulation of animal feeds and ingredient definitions is the AAFCO. When referring to definition of terms, their definitions are used. I would also like to provide ingredients listings and analyses of commonly available diets. The standard is Oxbow ( www.oxbowhay.com ), which is available through mail order and in some veterinary clinics and feed stores. Dehydrated alfalfa meal, dehulled soybean meal, ground corn, ground soybean hulls, wheat middlings, ground oats, soybean oil, cane molasses, dicalcium phosphate, ground wheat, dried whey, calcium carbonate, salt, magnesium oxide, l-ascorbyl-2-polyphosphate (source of vitamin C), DL-methionine, choline chloride, vitamin A acetate, dried yucca shidigera extract, cholecalciferol (source of vitamin D3), d-alpha tocopheryl acetate (source of vitamin E), folic acid, pyridoxine hydrochloride, calcium pantothenate, thiamin mononitrate, nicotinic acid, cyanocobalamin (source of vitamin B12), riboflavin, cobalt carbonate, manganous oxide, zinc oxide, ferrous carbonate, copper sulfate, zinc sulfate, calcium iodate, sodium selenite. Dehydrated alfalfa meal, wheat middling, dehulled soybean meal, soybean hulls, ground corn, ground wheat, animal fat preserved with BHA, dicalcium phosphate, salt, ascorbic acid, calcium carbonate, ferrous sulfate, manganous oxide, vitamin A acetate, calcium iodate, cholecalciferol, cobalt carbonate, dl-alpha tocopheryl acetate, cyanocobalamin, copper sulfate, riboflavin, nicotinic acid, calcium pantothenate, zinc oxide, menadione dimethylpyrimidinol bisulfite (source of vitamin K), magnesium oxide, folic acid, pyridoxine hydrochloride, thiamin mononitrate, biotin, choline chloride, sodium selenite. American Pet Diner is another mail order company. They are located in NV. They make both alfalfa and timothy hay based diets, but they are not highly recommended. For reference sake, I am printing all diets: best, good, and poor. Sun cured Timothy Meal, Dehulled Soybean Meal, Rice Bran, Molasses Dried Beet Pulp, Ground Lima Beans, Ground Wheat, Salt, Monocalcium & Dicalcium Phosphate, Calcium Lignosulphonate, Yeast Culture (Diamond V "XP"), Calcium Carbonate, Yeast Cell Wall Extract, L-Ascorbic Acid Phosphate (Stabilized Vitamin C), Mold Inhibitor (Propionic Acid, Acetic Acid, Sorbic Acid, Benzoic Acid, Ammonium Hydroxide), Vitamin E Supplement, Zinc Methionine, Copper Lysine, Manganese Methionine, Cobalt Glucoheptonate, Flavoring, Chromium Picolinate, Yucca Schidigera Extract, Mixed Tocopherols, Rosemary Extract, Ascorbic Acid, Citric Acid, Lecithin, Silicon Dioxide (carrier for liquid antioxidants), Folic Acid, Vitamin A Supplement, Vitamin D3 Supplement, Menadione Sodium Bisulfite (source of Vitamin K activity), Calcium Pantothenate, Riboflavin Supplement, Choline Chloride, Niacin Supplement, Thiamine Hydrochloride, Pyridoxine Hydrochloride, D-Biotin, Vitamin B-12 Supplement, Zinc Sulfate, Manganese Sulfate, Ferrous Sulfate, Copper Sulfate, Ethylene Diamine Dihydroiodide, Sodium Selenite. Suncured Alfalfa Meal, Dehulled Soybean Meal, Rice Bran, Molasses Dried Beet Pulp, Ground Wheat, Whole Pressed Safflower Seed Meal, Ground Lima Beans, Corn Oil, Soybean Oil, Monocalcium& Dicalcium Phosphate, Calcium Carbonate, Yeast Culture (Diamond V "XP"), Calcium Lignosulphonate, Salt, Yeast Cell Wall Extract, D,L- Methionine, Vitamin E Supplement, L-Ascorbic Acid Phosphate (Stabilized Vitamin C), Mold Inhibitor (Propionic Acid, Acetic Acid, Sorbic Acid, Benzoic Acid, Ammonium Hydroxide), Zinc Methionine, Manganese Methionine, Copper Lysine, Cobalt Glucoheptonate, Chromium Tripicolinate, Flavoring, Mixed Tocopherols, Rosemary Extract, Ascorbic Acid, Citric Acid, Lecithin, Silicon Dioxide (carrier for liquid antioxidants), Yucca Schidigera Extract, Vitamin A Supplement, Folic Acid, Vitamin D3 Supplement, Menadione Sodium Bisulfite (source of Vitamin K activity), Calcium Pantothenate, Riboflavin Supplement, Choline Chloride, Niacin Supplement, Thiamine Hydrochloride, Pyridoxine Hydrochloride, D-Biotin, Vitamin B-12 Supplement, Zinc Sulfate, Manganese Sulfate, Ferrous Sulfate, Copper Sulfate, Ethylene Diamine Dihydroiodide, Sodium Selenite. In addition to poor ingredients, APD diets have been using ingredients with BHA/BHT as preservatives. The preservative listing laws are getting stricter, so perhaps things change on labels soon. Thanks for putting up a thread on this. I didn't really know how to analyse pellets but your advice makes sense. Do you have the data for Kaytee Fortidiet? If not, I can stick it in. If it's okay with you, I'd like to include your advice for evaluating pellets on the nutrition page that I just did. And I could use a link to this thread to see how the different pellets stack up. Wheat Middlings, Dehydrated Alfalfa Meal, Soybean Hulls, Dehulled Soybean Meal, Cane Mollasses, Limestone, Dicalcium Phosphate, Soybean Oil, Lignin Sulfonate, Ionized Salt, Vitamin E Supplement, Vitamin A Acetate, Vitamin D3 Supplement, Vitamin C Supplement, Niacin, Riboflavin, Choline Chloride, Pyridoxide Mydrochlorid, Folic Acid,, Biotin, Vitamin B12 Supplement, Maganese Oxide, Ferrous Sulfate, Zinc sulfate, Copper Oxide, Sodium Selenite, Calcium Iodate, Yucca Schidigera Extract, Dried Bacilius Subtills Acidophilus Fermentation Extract, Saccharumyces Cerevisiae, Propionic Acid, Acetic Acid, Sorbic Acid, Benzoic Acid, Ammonium Hydroxide, Sodium Bentonite, Calcium Bentonite, Verxite, Sodium Bisulfite, Natural and Artificial Flavors. Ingredients: Dehydrated alfalfa meal, wheat middlings, soybean hulls, soybean meal, ground corn, corn gluten feed, dehydrated celery, suncured chopped alfalfa, timothy hay, dicalcium phosphate, salt, ground limestone, molasses, ascorbic acid(source of Vitamin C), Vitamin A Acetate, D-activated animal sterol (source of Vitamin D3), Choline chloride, Vitamin E supplement, Niacin, Riboflavin, Pyridoxine hydrochloride, thiamine mononitrate, d-Calcium Pantothenate, Menadione sodium Bisulfite Complex (source of Vitamin K Activity), Folic Acid, Biotin, Vitamin B12 Supplement, Magnesium Oxide, Ferrous Carbonate, Ferrous Sulfate, Zinc Oxide. Vita - Guinea Pig Formual w/ garden vegetables. Mnf: Sun Seed Company, Inc.
Vitamin A (min) 18000 IU/lb. Vitamin D3 (min) 1100 IU/lb. Vitamin C (min) 400 IU/lb. Ingredients: dehydrated alfalfa meal, kibble corn, dehydrated celery, dehydrated carrot, dehydrated potato, dehydrated bell pepper, dehydrated parsley, dehulled soybean meal, ground yellow corn, ground whole oats, wheat middlings, cane molasses, corn starch, animal fat (preserved with BHA), Calcium carbonate, dicalcium phospate, salt, corn oil, magnesium, ascorbic acid(source of vitamin C), D-activated animal sterol (source of vitaim D3), d-Alpha tocopheryl acetate (source of Vitamin E), Menadione sodium bisulfite (source of vitamin K activity), Vitamin B12 Supplement, folic acid, thiaminie mononitrate, pyridoxine hydrochloride, manganese sulfate, ferric sulfate, ferrous carbonate, copper oxide, calcium iodate, sodium selenite, cobalt carbonate, natural and artificial colors. Last edited by Lynx on Sun Aug 03, 2003 1:42 pm, edited 6 times in total. Dehydrated Alfalfa Meal, Ground Corn, Dehulled Soybean Meal, Ground Oats, Ground Wheat, Dehydrated Carrots, Whole Oats, Rolled Barley, Wheat, Shelled Peanuts, Dried Bananas, Striped Sunflower, Dicalcium Phosphate, Dried Cane Molasses, Corn Oil, Dried Whey, Salt, Calcium Carbonate, Magnesium Oxide, Potassium Chloride, Ascorbic Acid, DL-Methionine, Yucca Schidigera Extract, Vitamin A Supplement, Choline Chloride, Ferrous Carbonate, Riboflavin Supplement, Manganous Oxide, Ethoxyquin (a preservative), Zinc Oxide, Vitamin B12 Supplement, Vitamin E Supplement, Niacin, Menadione Sodium Bisulfite Complex (source of vitamin K activity), Copper Oxide, Cholecalciferol (source of vitamin D3), Calcium Pantothenate, Pyridoxine Hydrochloride, Thiamine Mononitrate, Biotin, Folic Acid, Calcium Iodate, Cobalt Carbonate, Sodium Selenite. Dehydrated Alfalfa Meal, Ground Corn, Dehulled Soybean Meal, Ground Oats, Ground Wheat, Hulled Sunflower, Oats, Corn, Wheat, Oat Groats, Dehydrated Carrots, Green Split Peas, Barley, Toasted Corn Flakes, Dried Bananas, Raisins, Safflower, Shelled Peanuts, Pumpkin Seed, Dried Papaya, Dehydrated Sweet Potatoes, Dehydrated Apples, Dicalcium Phosphate, Dried Cane Molasses, Soy Oil, Salt, Calcium Carbonate, Magnesium Oxide, Potassium Chloride, L-Ascorbyl-2-Polyphosphate (source of vitamin C), DL-Methionine, L-Lysine, Yucca Schidigera Extract, Vitamin A Supplement, Choline Chloride, Ferrous Carbonate, Riboflavin Supplement, Manganous Oxide, Ethoxyquin (a preservative), Zinc Oxide, Vitamin B12 Supplement, Vitamin E Supplement, Niacin, Menadione Sodium Bisulfite Complex (source of vitamin K activity), Cholecalciferol (source of vitamin D3), Calcium Pantothenate, Pyridoxine Hydrochloride, Thiamine Mononitrate, Biotin, Folic Acid, Calcium Iodate, Cobalt Carbonate, Sodium Selenite, Artificial Color. Dehydrated Alfalfa Meal, Ground Corn, Dehulled Soybean Meal, Ground Oats, Ground Wheat, Sun-cured Timothy Hay, Whole Oats, Green Split Peas, Flaked Corn, Flaked Wheat, Rice Flour, Soybean Hulls, Dicalcium Phosphate, Dried Cane Molasses, Corn Oil, Dehydrated Carrot, Salt, Calcium Carbonate, Magnesium Oxide, Potassium Chloride, L-Ascorbyl-2-Polyphosphate (source of vitamin C), DL-Methionine, Yucca Schidigera Extract, Vitamin A Supplement, Choline Chloride, Ferrous Carbonate, Riboflavin Supplement, Manganous Oxide, Ethoxyquin (a preservative), Zinc Oxide, Vitamin B12 Supplement, Vitamin E Supplement, Niacin, Menadione Sodium Bisulfite Complex (source of vitamin K activity), Copper Oxide, Cholecalciferol (source of vitamin D3), Calcium Pantothenate, Pyridoxine Hydrochloride, Thiamine Mononitrate, Biotin, Folic Acid, Calcium Iodate, Cobalt Carbonate, Sodium Selenite, Artificial Color. Dehydrated Alfalfa Meal, Ground Corn, Dehulled Soybean Meal, Ground Oats, Ground Wheat, Dicalcium Phosphate, Dried Cane Molasses, Corn Oil, Salt, Calcium Carbonate, Magnesium Oxide, Potassium Chloride, L-Ascorbyl-2-Polyphosphate (source of vitamin C), DL-Methionine, Yucca Schidigera Extract, Vitamin A Supplement, Choline Chloride, Ferrous Carbonate, Riboflavin Supplement, Manganous Oxide, Ethoxyquin (a preservative), Zinc Oxide, Vitamin B12 Supplement, Vitamin E Supplement, Niacin, Menadione Sodium Bisulfite Complex (source of vitamin K activity), Copper Oxide, Cholecalciferol (source of vitamin D3), Calcium Pantothenate, Pyridoxine Hydrochloride, Thiamine Mononitrate, Biotin, Folic Acid, Calcium Iodate, Cobalt Carbonate, Sodium Selenite. To ensure a balanced diet, add foods high in vitamins and minerals or feed a nutrient complete food such as Kaytee Forti-Diet or Kaytee Exact. Dehydrated Alfalfa Meal, Dehulled Soybean Meal, Ground Corn, Rolled Oat Groats, Rolled Barley, Wheat Middlings, Ground Oats, Ground Wheat, Cane Molasses, Dicalcium Phosphate, Corn Oil, Salt, Lignin Sulfonate, Calcium Carbonate, Potassium Chloride, Fish Meal, Brewers Dried Yeast, Iron Oxide, DL-Methionine, Ascorbic Acid, Vitamin A Supplement, Choline Chloride, Ferrous Carbonate, Riboflavin Supplement, Manganous Oxide, Ethoxyquin (a preservative), Zinc Oxide, Vitamin B12 Supplement, Vitamin E Supplement, Niacin, Menadione Sodium Bisulfite Complex (source of vitamin K activity), Copper Oxide, Cholecalciferol (source of vitamin D3), Calcium Pantothenate, Pyridoxine Hydrochloride, Thiamine Mononitrate, Biotin, Folic Acid, Calcium Iodate, Cobalt Carbonate, Sodium Selenite. Last edited by Josephine on Wed Feb 19, 2003 4:27 pm, edited 1 time in total. Lynx, go right ahead. I'm still working on this thread as I type. It would be nice to have a place I could put this for reference. I'm just fooling around right now. Could you correct my typo in the first post? It says "timothy had", not "hay" as I wanted. Those typos bug me and I usually don't notice until it's past the editing limit. If anyone has any other diets to post urls and ingredients listings/nutrient percentages, feel free to post them here. I still don't have any info on Blue Seal. I searched here and other forums and their official site. So how would you rank these products? Which brand would you recommend using the most? I currently use Kaytee Forti-Diet. No nuts or anything in it. Sorry, I probably sound dumb but I'm not too good at understand all of the ingredients. Son't be sad, I am completly lost as well. I was told that Forti-Diet was the way to go so I have been using it. Is that wrong? It's hard to do a ranking. I'm working on some method to do it systematically. Kaytee is somewhere in the middle (better than Hartz certainly). However, it contains harmful ethoxyquin (a preservative) and undesirable corn and corn oil. My purpose is to have people read the first post and then be able to examine their diets for the amounts of poor quality ingredients on their own. There are just too many brands and diets to list them all. It will help if people discuss them in one place (this thread, perhaps) and post urls or names of other diets available to examine. 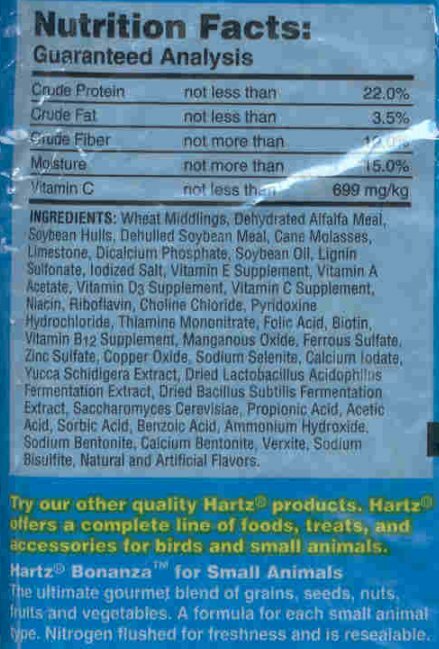 8 in 1, Hartz, Vitakraft, Hagen, and L/M are not listed on the internet (as far as ingredients) with my searches. I know several of them use ethoxyquin, BHA, BHT, colorings, and animal fat. Must be a reason they're not published on the web. I'll see what I can find "in the field" as I have time. Based on?? I'm not looking to argue but I have found nothing in the Proform that would not rank it right up there with Oxbow Cavy Performance. Did you find anything in the Proform that caused you concern? I'd like to make sure I'm feeding my pigs top quality feed. Yes, based on the findings I have so far. Reread the first post with ingredients to avoid. The oil is one of them, and it isn't pure anything, a byproduct to be more precise. Proform is middle ground, maybe better. Fairly close to Oxbow, maybe. "Vegetable oil lipid, Forage products (alfalfa), grain products (wheat and barley, used as a binder, no corn), plant protein products, roughage products"
Any ingredient with the word "product" after it is suspect. It could almost be anything left over after all other human grade ingredients are processed out. Sometimes useful, often not. Usually not nutritionally great. If I could get nutrient values on the suspect "products" above, it might help to grade it better. It's just floating in the upper half for now. In general, pet food companies are owned by larger corporations that make human foods and products. The ingredients that they can find no use for at all for the human products are put into many pet foods. That's a reason (one of many) that there are so many mediocre feeds for animals. Last edited by Josephine on Wed Feb 19, 2003 6:30 pm, edited 1 time in total. I can give you the phone number for the nutritionist at Proform. He has talked to me countless times and is more than patient. Canada's labelling laws are very different than ours, part of the reason they are no longer exporting to the US. I also had a huge problem with the "vagueness" of the labelling. He talked to me for over 40 minutes one time. The "grain products" was big for me, I wanted nothing with corn, which you can see most of the pellets rely on. He told me there is no corn in it, it is wheat and barley for binders. I was thrilled that they used food grade vegetable oil rather than animal by products. I saw where you listed no vegetable "fiber", but does that also include oil? Hey, can you do the analysis yourself? I would be more than happy to send you some to test. I'll call the guy from Proform and ask him some more questions, especially on the suspect "products". More than anything, I would like to know myself. Last edited by kleenmama on Wed Feb 19, 2003 6:35 pm, edited 1 time in total. Yup, I did consider Canada's laws to be different. It would be great if we could find out EXACTLY what the ingredients are. Of course, I still think pellets should ALWAYS be supplements and good grass hay with fresh high-quality veggies daily should be the basis of the diet. HA! Unfortunately, I know no one in a lab who could really do what I want. Organic chemists might also be helpful. I would include oil in the seeds, nuts, oils to be given in small amounts only. It is likely the Oxbow feeds do have a small amount with the soy meal. Email me and I'll give you his number. You know the right questions to ask since you are doing this. I was looking for specific things each time he and I have talked.